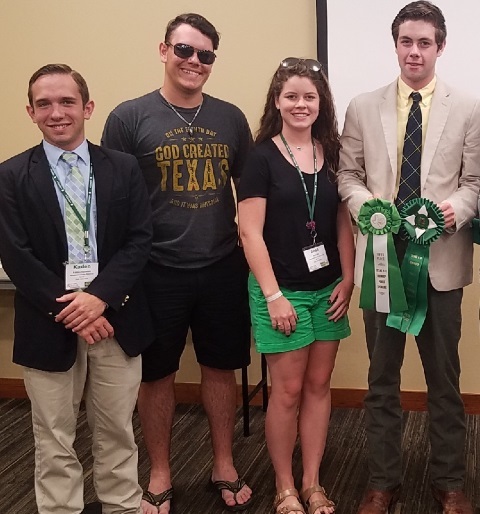 The Texas State 4-H Roundup, held in early June at Texas A&M University, features many competitions and more than 2,500 competitors. In order to be invited to compete at the state level, students must have placed either 1st or 2nd at the district competition, each of which comprises several counties. Skeeter Gilbreath, Kaden Harman, Jake Hill, and Jess Hill, who all placed 1st at district, were invited to the state competition and competed, representing Regents Academy’s club for the first time. Also, thank you to Mrs. Jeni Gilbreath, who served as chaperone for the competition. What a great way to kick off Regents Academy’s brand new 4-H Club! 65 students and more than 20 parents and teachers attended the club’s first meeting, along with Mrs. Claudann Jones. Students and parents heard the many ways they can get involved and serve the community through 4-H.